Our previous blog appealed to the FDA to more strictly regulate the greedily anarchic and rapidly growing e-cigarette industry. The FDA must stop the epidemic of teenage vaping before it causes all sorts of harmful unintended consequences. This blog tackles an equally controversial question that also must be urgently asked and answered, despite the lack of clear evidence-based guidelines: Should clinicians recommend vaping as the first line treatment for smoking? The case for vaping over smoking seems compelling on its face. Toxic tars and carbon monoxide make the smoke of conventional cigarettes our most lethal killer. Two thirds of smokers die from a smoking related illness, and die an average of 10 years earlier than non-smokers. The rate of smoking in the US has dropped by two-thirds in the past 50 years — from over 42% to 14%. This is probably a greater contribution to the overall health of our country than all the new cancer drugs discovered during the same period. But smoking still kills 480,000 people per year in the US. It is responsible for half the deaths from 12 different types of cancer and is a major cause of cardiovascular death. 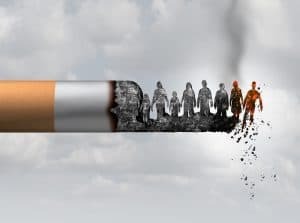 The remaining 34 million smokers are a battle tested, hardened target — they have smoked through all the many and dire cancer and heart warnings, and continue to smoke despite all the available smoke-ending medications and nicotine replacements. Evidence-based judgment on the effectiveness, safety, and indications for vaping is impossible because the research literature studying it is almost non-existent. E-cigarettes are produced by hundreds of relatively new companies and peddled as consumer products in commercial competition with cigarettes. They have not undergone the research regimen that would have been required had they received FDA approval as a new medication. Although drug company research is fatally flawed by its huge profit motive bias, it does provide at least some evidence of safety and efficacy. In contrast, decisions balancing the benefits and risks of e-cigarettes must be made flying blind. The attitude toward e-cigarettes of the major physician organizations, cancer societies, and anti-smoking groups has been consistently and understandably cautious. They continue to recommend that smokers, attempting to reduce cigarette consumption or quit altogether, first use FDA approved medications or the over the counter nicotine patch or gum. Vaping would be reserved as last resort for those who have already failed using the older, more conventional and better tested methods. This lack of enthusiasm for e-cigarettes would make great sense if pills, patch, and gum really worked well — but clearly they don’t. The majority of the relatively few remaining smokers want to quit and try to quit, but fewer than 10% actually do succeed in quitting. Continuing to recommend the old smoke-ending treatments that don’t work very well feels much safer than recommending the newer unstudied e-cigarette approach, even though it is likely to be much more effective. But caution in this instance is really extremely risky. It is more dangerous to complacently stick with a proven loser than to take a flyer with a potential big winner. E-cigarettes provide the smoker’s brain with the quick hit of nicotine it craves, without burdening his other organs with the toxic chemicals that are contained in tobacco tars and with the carbon dioxide that is contained in tobacco smoke. Smokers much prefer vaping to gum and patch because of its quicker nicotine-to-brain transport and because e-cigarettes provide some of the same physical sensations and pleasures of smoking. Compliance to vaping is much higher than with pills. E-cigarettes are not risk free. Correlational studies suggest nicotine may have cardiovascular risks. People who vape nicotine may go on to vape other drugs. The chemicals used in flavorings may increase the risk of lung disease. And it is likely that some smokers will vape in addition to, rather than instead of, smoking — using e-cigarettes only in public places where smoking tobacco is increasingly outlawed and smoking as much as they ever did in private. They would then burden themselves with all the risks of cigarette smoking plus the lesser, but not negligent, risks of vaping. Vaping is obviously not a benign habit that everyone should feel comfortable indulging in, but for hardened smokers the potential benefits seem to far exceed the potential risks, which pale when compared to the proven horrible risks of tobacco smoke. At the same time, we must do our best to stop the vaping epidemic in teenage non-smokers — for whom the obvious risks greatly outweigh the non-existing benefits. When clinicians recommend e-cigarettes as a substitute for conventional cigarettes, they do so based on clinical judgement alone, unsupported by scientific fact or established guidelines. I am usually quite skeptical about new treatments. Their claims are always hyped, partly for commercial gain, partly because naive future hope springs eternal even in the face of bitter past experience. Benefits are shouted from the rooftops, risks are hidden or minimized. The longer any product is on the market, the less effective and more dangerous it proves to be. All that said, I am bullish on e-cigarettes for hard-core smokers and don’t think we can wait for all the facts to come in. Too many people will smoke themselves to death while the research results slowly trickle in. I think we need to accept a harm reduction tolerance of imperfection. History proves that stopping smoking altogether is a highly desirable, but for most people, a completely unrealistic goal. Anyone still smoking, despite all the many strong pressures against it, is unlikely to easily give it up. Expecting the excellent can often be the worst enemy of achieving the good. 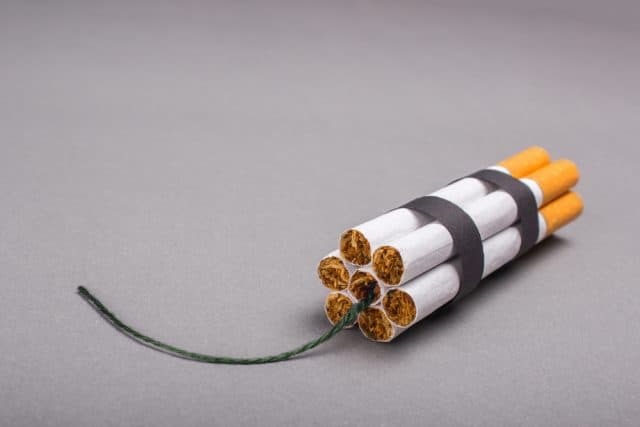 Once we accept that quitting is a laudable, but often unachievable goal, reducing the number of conventional cigarettes smoked becomes the more achievable target. E-cigarettes may be our best bet to prevent diehard smokers from dying of smoking related illnesses.